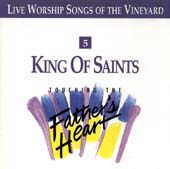 King of Saints: Vineyard Music EXTRA! This was actually Vineyards third TFH release in time-line fashion. TFH #1-3 were all released at the same time, and were more of a Winds of Worship type album, being a mix of new, and previously released songs. It was a successful kick off; TFH #4 followed, (But they were not officially numbered then) which contained some great songs that we still do today. TFH #5 shows the Vineyard Music Groups refinement of the process. The songs are blended together better, and the applause tracs mixed in are not too canned like in the first four. This is also the album where Vineyard moved decidedly away from chorus worship, and mixed the worship leaders voice level noticeably above the other singers, which helped to set the TFH series apart from Hosanna and Maranatha music at the time. It is also a very intimate album, with classic songs like Refiners Fire, God Is So Good, and I Lift My Eyes Up. These are all songs which our church did, and we continue to hear them in the Christian community. Five of the songs in the first set, Blessed Are They, The Victory Is The Lords, Ive Got My Armor On, Call the Elders, and King of Saints, are all fast songs by Kevin Prosch. I personally hold each one dear, but by far the best one is King of Saints. When played well live, nothing compares. Call The Elders also stands out; the verses and chorus is straight from the Bible, and it is a song of exhortation to the body more than a worship song. It also has very deep and repetitive bass, like a rap song. Set two, while good, leaves less of an impression on you, save for I Lift My Eyes Up. The first song, Lead Me, comes off in my opinion, as a bit hokey. It may bless others, though, but it is too bubbly and brightly sung. The music is good, however. When I Bow down, and Nothing Can Compare are nice, intimate, throne of God songs. The album is rounded out nicely with an excellent version of Crown Him With Many Crowns, which shows that Vineyard embraces hymns, but played with modern instruments in a relative way to todays expected worship performance. This is one of my favorite TFH releases, and it was neat getting to BE THERE when it all happened. Today it sounds a little dated, but not much. Enjoy! Nick Scebba <nik@grand-t.com> was saved in 1988 at the Valley Vineyard Christian Fellowship in Spring Valley, Ca. He currently lives in Northern Lower Michigan, and attends Living Hope Assembly of God there where he plays the djimbe drum in the youth worship band.